Traditionally in Kentucky great mounds of brush are piled and burned in February to prepare a bed for tobacco seedlings. I remember spending most of the day hauling and piling brush. My dad would start the fire in late afternoon and we would sit up most of a cold February or March night stoking the fire, watching the stars, and roasting hot dogs or marshmallows over the bonfire. Many times neighbors would stop by and sit with us for a spell around the fire, talking into the night. In late May or early June the tobacco plants are taken from the beds and set into the freshly worked Kentucky soil. The whole family is at work pulling plants, riding the tobacco setter pulled behind the tractor, or hauling plants and water to the tobacco field. The first rain after the setting the kids use a pointed stick to wade the mud and reset plants which didn't survive. The heat of late June and early July is a time of plowing and hoeing the tobacco to keep weeds out of the patch. In early August the tobacco must be topped. That is, the large white and pink blooms are cut by hand from each plant. In late August and early September the large leaves have ripened and turned golden in color. The tobacco plants are cut, speared onto wooden sticks, and left in the patch for a few days to begin the curing process in the late summer sun. 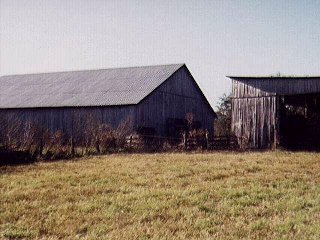 The tobacco is then hauled by wagons to the barn where it is hung on poles all the way to the top of tall tobacco barns. It is left there to finish curing for about two months. When the frost of late October and early November arrives everyone waits for a warm rainy night which will bring the tobacco into case. That means bring high enough humidity that the dry and crumbly leaves will become moist and pliable. At that point the whole family spends days in the barn taking the tobacco down from the poles, piling it into bulks where it can be covered to stay moist and then stripping the leaves from the stalks. The leaves are graded into groups based on the color and texture of the leaf and tied into hands. We used to grade the leaves into trash, lugs, light, dark or red, tips and green. Usually one person is assigned to strip each grade and the stalk is passed down the stripping table from one person to another. The most experienced stripper starts the process by taking off the trash. At the far end of the table the youngest children just learning to grade tobacco strip the tips and green. By the time the stalk gets to them, the only leaves left are tips or green. Then after Thankgiving the tobacco is hauled to a tobacco warehouse in a distant city and the whole family makes a holiday of going to the sale. They stand in a cold warehouse with other farm families from all over the state and listen to the chant of the auctioneer as their returns for the year's work are decided. The check received that day will be used to pay the debts accumulated at local merchants throughout the year and the amount of money left over determines the size of the pile of presents that will be under the tree on Christmas morning. With the help of early summer rains and the hot July sun burley tobacco grows on rich Kentucky farm fields. In August the leaves ripen to a bright yellow and the stalks are then cut by farm families and hung in barns on Kentucky hillsides to cure. The cool mornings and warm sunshine of October and the rainy nights of November make the leaves the various shades of yellow, brown and dark red desired by tobacco companies for fine smokes. It is then that anyone walking near these barns notices the sweet tobacco aroma. As the leaves lose their moisture and regain enough from humid nights and foggy mornings to become soft and pliable the farm family begins to take the tobacco down from the poles in the barn and strip the leaves and tie them into hands for sale. 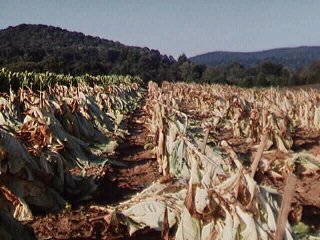 Tobacco stripping season in Kentucky is in November and December and tobacco sales begin just before Thanksgiving. Tobacco seeds, as I'm sure you know, are very small. The most common mistake is covering them too deeply. We just spread them in a mixture with fertilizer or soil on top of the ground prepared for a tobacco bed and then walk over the top of the bed to push them into the soil. They will not germinate while the soil is cold which is why we don't sow the seeds until late March or April. Hello Duane, my name is Kerry Cunnington, I live in Queensland, Australia. I have started growing my own tobacco, and while searching for information on the subject, came across your home page. I have planted 300 plants which have reached about 3' in height. They have put up flower heads, which I removed, except for the ones I will let go to seed for future planting. When you cut your plants and spear them onto sticks in the field, do you pass the stick through the stem of the tobacco plant? How many plants per stick? does it matter if part of the plant is still resting on the ground? As this is my first attempt at growing tobacco I'm sure I'll get much of it wrong, but I have to start somewhere. I have grown it through our winter, and after reading how you grow it, it seams I have done things back the front. Our winters are very mild, we didnt even get a frost this year. I think that I will have trouble with the curing as this will happen in spring/early summer when the temperature is getting up a bit. We use a spear which is a very sharp cone shaped steel piece placed on the upper end of the wooden stick which has been driven far enough into the ground to stay upright. The stem of the tobacco plant is pressed onto this about a foot from the larger (bottom) end. This causes the stem to split so that it can be slipped down onto the stick. About 5 to 7 tobacco stalks are speared onto each stick. Be very careful in use of a spear, if you can obtain one. A high school friend of mine put his head above the spear and when the tobacco stalk split and went down onto the stick he lost an eye. We try to leave the sticks upright in the field for 3 to 5 days with the lower end of the stalks (which was the top of the plant) resting on the ground to support the stick. They are left in the sun to begin the curing process. Also they are lighter to haul into the barn and hang if some of the moisture has dried out. We are now in the middle of our tobacco harvesting season at the first of September but since the seasons are six months different in Australia it would be a weird time to be harvesting tobacco. like yourself,i also grow burley tobacco. this year my familey and i hope to produce over 70,000 pounds. we have gotten away from curing in barns and began using scaffolds constructed of high tensil wire.we no longer use sticks, prefering to cure directly on the wires.this method has cut our labor costs and made the harvest a lot easier on us since we strive to do most of the labor ourselves. i would be pleased to hear from other growers like yourself. Your pictures and narrative brought back many memories of when I was a youngster on a tobacco farm in Lucas KY (Barren county). I do remember crawling down the rows to "prime" the plants by pulling the bottom leaves off as they turned brown. It was not a job that I relished. I also remember trying to keep up with my Grandfather as he would go from plant to plant pulling the Tobacco worms off and throwing them in my general direction as he popped the heads off! My favorite time was the harvest when all of the other farmers in the area would work from farm to farm to get the crop in. I used a chopping knife and my uncle was the spiker. Thanks for the memories. I understand proper fertilized is very important in tobacco growing practice. 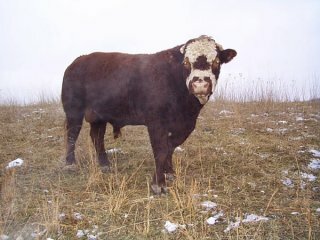 I would very much appreciate if you could provide fertilization program for tobacco. The standard recommendation is 1 ton of 5-10-15 per acre before setting with a topdressing of 100 to 150 pounds of nitrogen per acre at second plowing. However, it is best to get a soil test and get recommendations for that specific plot from the Cooperative Extension Service. Trace elements such as selenium or molybdenum may also be needed. Many people also apply herbicides, insecticides and fungicides with the fertilizer. I was facinated reading about how you grew tobacco on your farm. I live in northern Minnesota and tried growing tobacco here. Surprisingly, I was able to grow a bumper crop this year. I was just wondering if it is necessary to prune the leaves of the plants back to a certain number, as I had read somewhere this needs to be done. I could also use any other information you have on curing the leaves. In answer to your question about growing tobacco, with burley tobacco we do not prune the leaves. What we do is top the plant. When about 1/3 of the patch is in bloom and the rest is beginning to bloom the idea is to cut off the top part of the plant including the flower or flower bud and the smaller leaves at the top of the plant. The plant is then left in the field to grow for about 3 weeks during which time it is not allowed to grow suckers (stem sprouts). This can be prevented either by chemical sprays or by cutting the sprouts every few days so that they do not get bigger than a man's thumb. The reason for topping is to channel all late season growth into the crop leaves which are the remaining leaves on the plant. After topping these leaves will become longer, wider, and thicker. There may be 12 or so of these leaves. The number will vary depending on the individual plant. During this late season growth the color of the leaves will change from green to a golden yellow. The plants are ready to be cut when the bottom leaves begin to deteriorate more than the top leaves are growing. It is expected that 3 or 4 bottom leaves may be lost to deterioration before or during harvest. Thank you for your page on tobacco cultivation and curing. I know more and still am "dumb as a post" about the curing process. I was gifted some culls which I have tended well. The giver said I was suppose to pull the lower leaves from the stalk which I did. I tied sever together and hung them in the attic. My first pull dried and looks quite strange. I have thought that this is not the way. I am native American and desire to learn how to produce my own tobacco for gifting, prayers, and enjoyment. Have always wanted to know this since I was first gifted my first piece of a hand of tabacco which was golden, beautiful, and tasty. I would like to leave the world of the ready rolled smoke and enjoy a chemical free tobacco experience. I would appreciate any education you may give and directions to other sources for learning this art. I'll be glad to try to give you some pointers. Understand that my knowledge and experience is with Kentucky burley tobacco. Practices are different with North Carolina dark or western Kentucky fire cured tobacco. Burley is air cured by hanging in barns. We are now in late August and through September in the process of cutting and hanging tobacco. We do not take any of the leaves from the stalk (they do that in NC). We simply cut the stalks and spear 5 to 7 of them onto wooden tobacco sticks about 5 feet in length. The sticks are driven into the ground upright so that the tobacco is exposed to the air and sun and left in the field for two to seven days. This gets some of the moisture out of the tobacco to begin the curing process and makes the sticks lighter in weight for hauling and hanging. We then haul the tobacco to the barns on wagons. The barns are tall barns with 2 to 7 levels of tier poles built into the barns. The tier poles are just far enough apart to support the ends of the tobacco sticks. The sticks are hung on the poles with the stalks of tobacco speared on the sticks then hanging vertically with enough space between them for air circulation to allow proper curing. It is important that the tobacco cure neither too fast nor too slow. Ideal tobacco curing weather occurs in Kentucky in the fall with low humidity and days with plenty of sunshine and temperatures from 70 to 90 degrees and cool nights in the 40s to 60s. The color of the tobacco will not be right if the temperature is too high which is what I suspect happened to your tobacco in an attic. The other thing you should know is topping. When the tobacco plants are beginning to bloom (10% to 25% of the plants are in bloom) the tobacco must be topped. This means cutting off the top of the plant including the bloom and the small leaves at the top. This is to be sure the growth of the tobacco takes place in the leaves. The idea is to make the bigger lower leaves become longer, wider and thicker. The tobacco will grow sprouts (suckers) on the stalk after topping trying to bloom again. These must be removed before they get as big as a man's thumb. We do this with chemical sprays that prevent sprouting. But it can be done, and was in olden times, by going through the patch every few days breaking or cutting off the suckers. 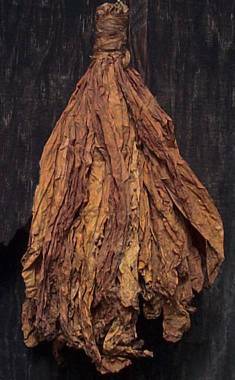 Usually the tobacco is allowed about three weeks after topping before it is cut. The longer it stands the better until the lower leaves begin to deteriorate. It takes 90 days from the time the tobacco plants are transplanted into the field until harvest. Probably 80% of the quantity and quality of leaf produced is determined by what happens in the last 20 days from topping to harvest. We received a question about growing tobacco in the desert of California from Curt Dawson. Our experience is, of course, with burley tobacco which goes into cigarettes and we have no idea how well tobacco will grow in the desert. Actually though, in dry years, burley grows a much smaller plant with lower moisture content in the leaves and more gum on the plants, so maybe the types you are planting would do this also in the desert. Burley is harvested by cutting the mature plants and spearing five or six of them on 5 foot long wooden "tobacco" sticks. They are then hung on poles in a barn to dry for six to eight weeks. The leaves are then stripped from the stalks during a rainy time when they are pliable and graded by texture and color into two to six grades. They are then baled in a wooden box designed for that purpose into bales of about 80 to 100 pounds and sold in that form. In the barn slow curing is best. Extremely hot weather can cause barn burn of the leaves and extremely humid weather can cause darkening of the leaves. 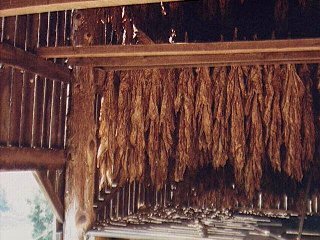 The way stripping is done in Kentucky is during a period of high humidity when the leaves become moist enough to be pliable and not crumbly (we say the tobacco is "in case") the sticks of tobacco are taken down from the barn. The stalks with leaves are removed from the sticks and piled under a piece of plastic to retain moisture. This is called "bulking down". Then a stripping table is formed. This means we lay some boards on a support to make a table about ten feet long and a couple of feet wide. A number of graders (people) equal in number to the number of leaf grades spread out along the table. The "gopher" carries bundles of stalks from the bulk to the head of the table. The first grader (trash) takes off the leaves of his grade and either holds them in his hand if the leaf is to be tied into "hands" or places them in a box behind him if the leaf is to baled. He passes the stalk on to the next grader (light) who does the same for his grade. In this way the stalk is passed to "red or dark" then to "tips". Tips is at the foot of the table and removes any leaves remaining on the stalk. He then throws the stalk onto a wagon or onto a pile for "gopher" to carry to a wagon. Later these stalks will be spread on the fields. They are high in potassium. Some people also strip other grades such as "lugs" and "green". If the tobacco is to be tied into hands, each grader ties his hand with a carefully chosen tobacco leaf when he has a full hand and places the hand on a strip stick behind him. About ten or twelve hands are placed on each stick. A good stripper takes great pride in the looks of his hand, both in its consistency of color and texture and in the workmanship of the "tie". If the tobacco is to be baled. The bale is compressed with a jack and tied with two lengths of twine when the box is full. The bale will then usually weigh 80 to 100 pounds. Figure 300 to 400 pounds stripped per man day. I don't know about any books on the subject. Here in Kentucky each child learns to strip tobacco beginning at about six to eight years of age working first stripping tips, then later becoming "gopher" and moving up the stripping table. Usually head of the household works at the head of the stripping table. The kids also begin at the same age working in the tobacco plant beds weeding and pulling plants, then graduate to the setter. Head of household is the tractor driver at this time. During the growing season the kids get to hoe tobacco. It takes the bigger boys and men though to top and cut, spear, haul and hang tobacco. Before insecticides the kids also used to manually pick tobacco worms from the leaves. Hope this answers most of your questions. Hi, I am a seventh grade student, and I am doing research about tobacco farmers. I have a few questions about your farm. How many acres of tobacco do you have growing on your property? Is that about average for most farmers? Could you use the soil you grow your crops in for any other crops? If you could would you make more or less money? We have been growing about three acres of tobacco for the last ten or fifteen years but we will only grow about half that much this year due to cuts in the tobacco quota that we are allowed to grow. I don't know what the average tobacco crop is but I suspect ours is a little bigger than average. Sure, we could use our tobacco ground for most any other crop because we grow our tobacco on our best land. We could probably make $50 to $100 per acre per year growing pasture or hay or corn or soybeans on that tobacco land. 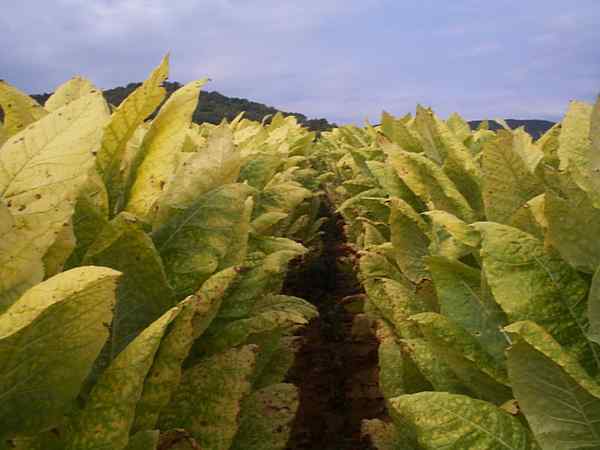 Tobacco returns us about $5,000 per acre, of which about $1500 is profit. 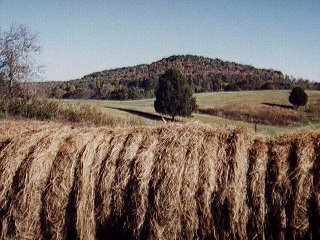 Hay harvested and rolled laying in the autumn sun. A description of the farm and pictures. Jump back to top of document. Last revised October 9, 2007.